Just in case you think that I think it’s Wednesday which is when I always send out my emails, I know it’s Thursday. I was sick yesterday, some kind of cold thing, or unless anyone saw me in a boxing ring Tuesday night and I don’t remember, because yesterday that’s what it felt like I’d been doing. Everything doesn’t hurt (as much) today so here we go. I’ve been asked, so I’m finally offering to you our Dehydrated Tomatoes. Dehydrated tomatoes can be added directly to soups and stews or placed directly on pizzas or nachos before baking. Dehydrated tomatoes may also be rehydrated by soaking in water, wine, bouillon or vegetable juice to cover. They usually rehydrate within one-half hour to 2 hours, depending on their size. If they`re soaked for more than 2 hours, they should be refrigerated. Using boiling liquid speeds up the soaking time. The soaking liquid may be used in cooking. I also made some of the Dehydrated Tomatoes into a Powder which steps up the tomato flavour tremendously. Tomato Powder is used like a spice to be sprinkled on hamburger patties as they are being formed, in salad dressings, sprinkled over fresh vegetable juice, in vegetable dips, an addition to pasta sauces of all sorts, including spaghetti sauce for a more intense tomato flavour, sprinkle into scrambled eggs before cooking, sprinkle over cottage cheese with cucumber and green onion, sea salt and sumac, add it to a more complex soup that is crying out for more tomato flavour . . . I`ve used it in place of tomato paste which I don`t usually have in my cupboard. Naturally antioxidant rich tomato powder boasts high levels of vitamins A, C, and K, making it a perfect choice for a healthier you! Tomato powder is hypersensitive to moisture, so store it in your refrigerator. A little goes a long way and it lasts forever. I just finished my jar made in the summer of 2014. I ended up with very few bags of Micro Salad Greens last week which were for sale at Heather`s. The pea shoots and sunflower shoots were ready, and again flew off the shelf at Heather`s, so I`ve stepped up production of pea shoots and sunflower shoots to hopefully provide for everyone. This week, I was able to up-pot some peppers and herbs and am disappointed I didn`t get out to the greenhouses yesterday to plant some Salad Greens and Spinach, which was my plan. I`ll get to it this weekend when I`m feeling much better. Herbs, fresh: Thyme and Citrus Thyme, $2 bunch Basil and Cilantro are growing nicely inside right now. If you'd like to purchase any of the above items, I'd be happy to provide them if available after our regular customers have ordered. Perhaps you might like to be added to our Weekly Delivery List. 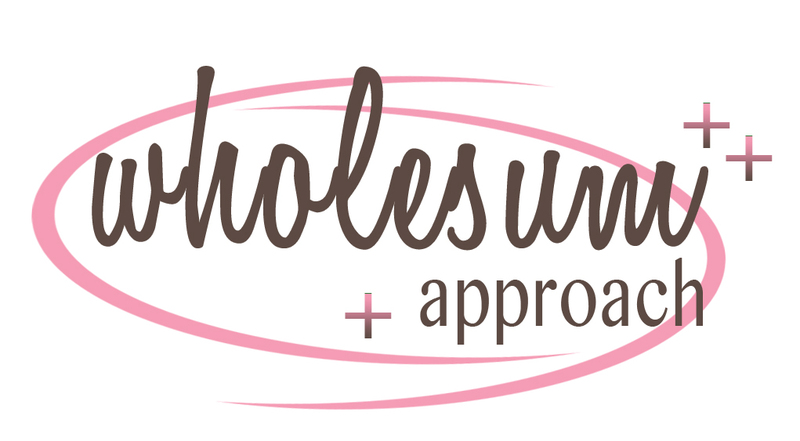 I send my email out every Wednesday (except this week), collect orders Thursdays and deliver Fridays (or another day convenient to us and you if you're not too close to home). See Contact information and email or call me. Thanks. And remember some of Day Brighteners Farm produce can be found at Heather's Healthy Harvest in Kemptville. Until next post, have a great every day. Once again, I'm pleased to have Carol Pillar, Holistic Nutritionist, provide us with very important information regarding the healthiest way to nourish our bodies with seeds and nuts. Every time I research a topic I find more interesting stuff! This subject ties in with the last blog about sprouts where I mentioned that many plants have natural “toxins” to safeguard their longevity. Thanks Joanne for asking me to expand on the most beneficial way to consume nuts and seeds. You are on the right track soaking and dehydrating the nuts for your granola recipes as they contain enzyme inhibitors that can make for difficult digestion in the human body. The inhibitor, namely phytic acid, can be reduced by soaking, sprouting or fermenting. Dehydrating, or slow gentle roasting will also somewhat reduce the levels but also ensures moisture is removed to prevent molds forming. We do produce some phytase (digestive enzyme) to help with the phytic acid, but as we age less is produced and if you regularly consume nuts and seeds this can become an issue. Thing is, there is another point worth remembering – even though these foods are considered good sources of minerals (along with B vitamins, folate, fiber and some protein) the phytic acid binds to the zinc, calcium and iron forming insoluble salts that are poorly absorbed in the gut. This inhibitor is also found in lesser amounts in grains and legumes, so it’s a good thing we generally cook them. Nuts and seeds provide many health benefits. Rich in antioxidants, zinc, selenium and vitamin E, healthy fats – the content and composition of these varies considerably between varieties and boosts the calories, so consume in moderation. Watch those pecans and macadamians they’re 85-95% fat! Once shelled, to protect the delicate oils, all should be stored in glass containers in the fridge. FYI – almonds are the lowest in fat, sesame seeds high in calcium, pumpkin seeds rich in zinc, bazil nuts best source of selenium, walnuts and flax seed contain omega 3 fatty acids. You say you have two Greenhouses? And where do you hide those greenhouses in the off-season? Here is a picture of the morning after “the Big Snow”. Tom and I removed frost blankets from the raised beds in the Greenhouses the other day, before the snow, and I was thinking how nice the days were longer and whatever plantlings hadn’t died from the winter cold would be happy for the extra daylight. Well, with the snow cover, it’s darker than night time in the greenhouses now. The sunshine today and tomorrow and the 5C on Saturday should take care of that issue. Who has time for such things as sowing seeds and up-potting seedlings when there’s snow to shovel. Six times yesterday I was out trying to make paths front and back and around the gas tank and oil pipes. We were low on both. I didn’t have the heart to call either, but sure enough Levac showed up without a call. The unplowed driveway didn’t bother their truck in the least. I also cleared four inches of snow from the van every hour and a half. It was like a mini-version of Ground Hog Day, the same amount of snow every single time I went out, like I hadn’t already done this, several times. The snow around the van just kept getting deeper and deeper. Dennis, not wanting to plow us out several times, came at the end of it all and did a wonderful job so Tom could drive in when he came home. The chickens are funny. Every time I go into the Pen to exchange their ice-water bucket for a water bucket, they eat the snow I brought in on my boots. They act like I brought that in for them as a special treat. I also found out they LOVE sunflower shoots, the ones that grew too tall for us to eat. They like them almost as much as mealworms. There’s a hawk which comes to the front deck railing just outside the living room window and screeches at me regularly. I was plodding my way through the snow past the front bird feeder this morning and, sure enough, the hawk came to the top of the spiraea bush to catch and collect its prey, two feet beside me. I clapped my mittened hands and yelled at him/her to go away. I know the hawk needs to eat, but I’d rather he/she not do so on my watch. I see a large shadow go by the window every now and then and assume it’s the hawk returning. Oh well, poor little birds. Could I ask a favour of you? If you eat yoghurt or sour cream or food which comes in white plastic containers, would you mind saving those for me please? I cut the sides in strips and use them as labels for my plants. Each time I up-pot a tray of eight 9-cell packs, I go from needing eight labels to needing seventy-two. That’s a lot of labels. Thanks. I can pick them up when I deliver to you next. I can't have too many. The banana “candies” and sunflower shoots last week were very popular, indeed. Heather has ordered all of Sunflower Shoots this week. I’ll make more from now on. I can’t say the same about the bananas, they’re not always available to me. And . . . ta da . . . as promised: Carol Pillar has provided us with information regarding the health benefits of soaking and drying or roasting nuts and seeds. See separate post titled Seeds and Nuts. 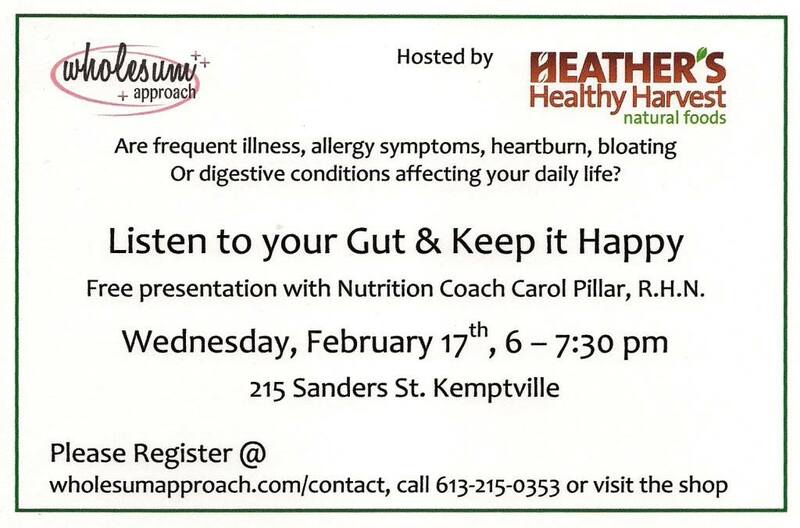 It is this week, as in this evening, Carol is presenting at Heather’s Healthy Harvest in Kemptville. If you have a concern about your gut health, this would be good information for you. Herbs, fresh: Thyme and Citrus Thyme, $2 bunch I’ll have basil and cilantro soon. Crunchy Bean Mix (peas, lentils and garbanzos) If you pre-ordered Crunchy Bean Mix Sprouts, I have them for you. If I put them on the menu, they are extras which I’ve made. Tomato Sauces: $6 500mL jar just did inventory and am down to 27 jars – amazing. If you'd like to purchase any of the above items, I'd be happy to provide them if available after our regular customers have ordered. Perhaps you might like to be added to our Weekly Delivery List. I send my email out every Wednesday, collect orders Thursdays and deliver Fridays (or another day convenient to us and you if you're not too close to home). See Contact information and email or call me. Thanks. Most of the pepper and edible flower seedlings have their second leaves!!! Please - try to contain your excitement. Considering the peppers themselves won’t be ready to eat until mid-summer, it’s a wonderful thing that they’re growing at this rate now. The plants will be shuffled around from shelf to shelf and moved to taller shelves and up-potted several times and brought into the Greenhouse to grow more before they’re transplanted into the ground. The trick is to keep them healthy and bug-free for the next two or three months. The flowers should be ready before the peppers to enjoy mixed into the Salad Greens on occasion. The second leaves you can really get excited about are the Salad Greens. I hope to have Greens to you by next week. I made something special this week – organic banana “candies” (aka dehydrated bananas), nothing added, just organic bananas, dried to sweet crispy chewiness. They are so delicious, they taste like a banana popsicle but not cold. These are my new favourite snack food. The herbs and little green onions have all germinated and I started more sweet peppers to replace a few that didn’t take, but most of them did. I really like sweet peppers and want to have enough. In the next few days, I’ll do up more herbs, flowers and start on the early tomatoes and cauliflower. It’s a pleasure to have Carol Pillar working with me on the Farm most of the year. She stops me in my tracks if I’m eating something in an unhealthy way, but am not aware that I am. On her recommendation, I’ve been reading about nuts and how much better they are for you when soaked and dried, so am starting to buy only raw nuts and am soaking and dehydrating them for your granola. I’ve invited Carol Pillar, Holistic Nutritionist, to explain why this is so in my blog next week. 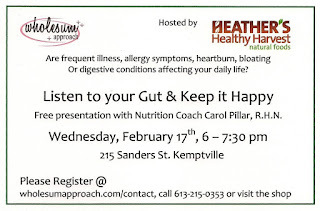 Carol is giving a talk tonight at Heather’s Healthy Harvest – see poster below. Perhaps the Happy Gut topic is of interest to you. This past week has been somewhat difficult as I hurt my back earlier in the week whilst lifting heavy bags of wet seed starter mix and moving shelves and full trays around making room for growing. Wednesday morning I knew I was in trouble when my lower back hurt, then a band across my middle back, then the shoulders, so I took it fairly easy that day. Thursday morning there was no taking it easy, I was down for the count. Tom came home early and did my chicken chores and lifted various items for me. Friday was delivery day, I was moving real slow, got the orders ready and Tom delivered for me. What the hardest thing is: to not move, to stay still - arghhhhh. There is so much to do and everything I do entails lifting, moving, shifting, bending . . . you get the picture. I visited our local chiropractor Monday morning and have been pretty good since then, more nervous about hurting my back again than actually in pain. That’s a good thing, keeps me on the straight and narrow. So, here are some photos of what’s growing on around here. The earliest seeds were planted January 22, that’s a very short while ago. Some seeds germinated in one day! The leeks popped up January 27 and are about 3 inches tall as of today. It’s so exciting watching the progress of all plants. The little basil plants are doing great and will be ready for adoption soon. The Salad Greens have their first leaves (called cotyledons) and will be ready to eat once the second leaves and those after that come out. This should keep us happy enough until several weeks from now when the ground can be worked and outside planting begins. It was so mild yesterday, Thomas came out from the Nation’s Capital and watered everything in the Greenhouses for me. The celery looks beautiful. The other seedlings like cilantro, parsley, spinach and various lettuces out there are … um … resting, ya, that’s it, they’re resting, like not growing. I imagine they, like the fox and skunks we saw around the chicken coop the other night, are confused as to what they’re actually meant to do right now. I know I’m confused. I did go out to the leeks in the garden the other day and gave the soil a kick to see if I could dig some up – no – not this week, the ground is pretty darn frozen out there, my toe will recover. “What seeds have I sown this week?” you ask. Thanks so much for asking. Let me tell you: six varieties of sweet peppers, cilantro, green onions, parsley, basil and thyme. I’ll get back to it again tomorrow. Now for the good stuff – what’s for eatin’ this week: - it’s only weeks until the list gets broader – C’MON SPRING!